Visual Thinking brings the science of perception to the art of design. Designers increasingly need to present information in ways that aid their audience’s thinking process. Fortunately, results from the relatively new science of human visual perception provide valuable guidance. 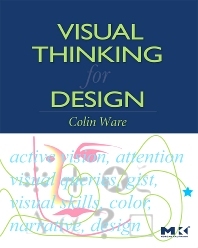 In this book, Colin Ware takes what we now know about perception, cognition, and attention and transforms it into concrete advice that designers can directly apply. He demonstrates how designs can be considered as tools for cognition – extensions of the viewer’s brain in much the same way that a hammer is an extension of the user’s hand. The book includes hundreds of examples, many in the form of integrated text and full-color diagrams. Experienced professional designers and students alike will learn how to maximize the power of the information tools they design for the people who use them. Designers of all kinds, including professionals and students in information design, industrial design, interaction design, web design, and users of information visualization, who need practical guidance in visual and cognitive science in order to excel at their jobs—or future jobs. THE DANCE OF MEANING Review Implications Design to Support Pattern Finding Optimizing the Cognitive Process Learning and the Economics of Cognition Attention and the Cognitive Thread What’s Next? The author takes the "visual" in visualization very seriously. Colin Ware has advanced degrees in both computer science (MMath, Waterloo) and the psychology of perception (Ph.D., Toronto). He has published over a hundred articles in scientific and technical journals and at leading conferences, many of which relate to the use of color, texture, motion, and 3D in information visualization. In addition to his research, Professor Ware also builds useful visualization software systems. He has been involved in developing 3D interactive visualization systems for ocean mapping for over twelve years, and he directed the development of the NestedVision3D system for visualizing very large networks of information. Both of these projects led to commercial spin-offs. Professor. Ware recently moved from the University of New Brunswick in Canada to direct the Data Visualization Research Laboratory at the University of New Hampshire.